..MPs are being asked to approve a huge change for our country in 2019 that they would never have dreamed of touching, were it not for a referendum in 2016. Fair enough, but be honest about it: we’re doing it because the voters asked us to. We do not, however, believe the voters reached the right decision. Why does this era have such difficulty in saying that last sentence? Surely the whole idea of representative rather than “direct” democracy is to provide counterbalance against a sometimes faulty popular judgment. Everybody knows that the people can sometimes reach the wrong conclusion because we know that we ourselves sometimes do so. Who doubts that popular opinion in the 1930s was wrong to favour appeasing Germany? Who doubts that in the 1950s the public were wrong to cheer on politicians towards the Suez debacle? The public, for a while, have been wrong about many great issues: slavery, hanging, flogging, the imprisonment of homosexuals. So if you believe in democracy you should believe in so much that must come with it: persuasion; a little foot-dragging; re-thinking; give and take on both sides. Politics negotiates with popular opinion: it doesn’t just take dictation. The Bishop must have had an absolute mountain of ironing to do, for he never returned. In fact, he must still be ironing, or perhaps he simply forgot. There are, of course, far more important things for bishops to do than tweet to Synod members. 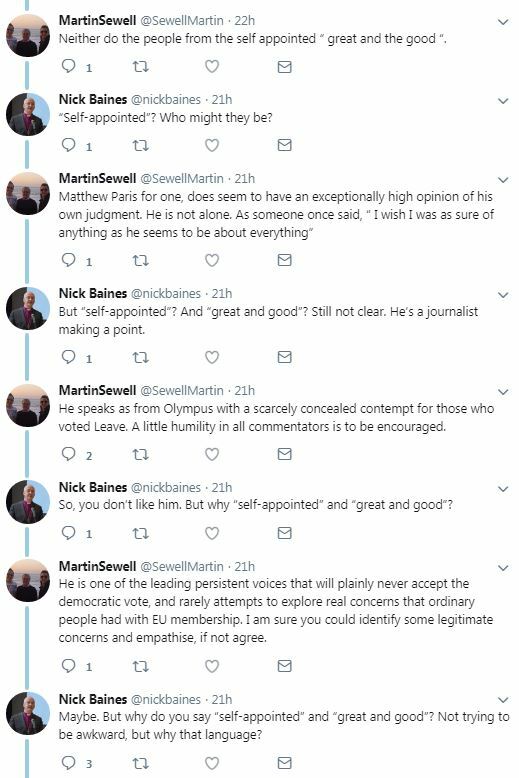 Especially belligerent Brexiteer sorts – you know, those who take issue with the self-appointed great-and-good telling them they voted the wrong way and their judgment can’t be trusted. A bit like like those stupid Germans who voted for Hitler. Our present impasse offers unusual scope for negotiation with the electorate. We did instruct government to negotiate Brexit but there’s no reason why, nearly three years later, we can’t be asked to judge the result. Are so few MPs ready to square up to their voters and use the language of second-thoughts? 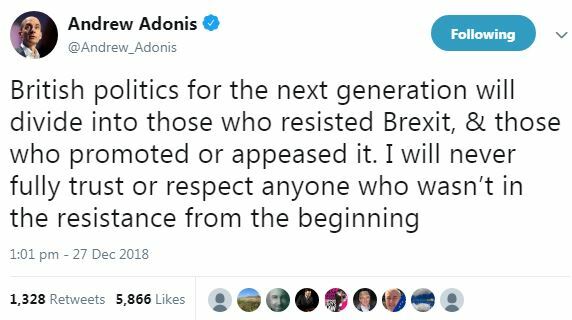 He complains ad nauseam about the EU Referendum having been a “vote in the dark” because the people didn’t really know (or understand) what they were voting for. You know, we could have been voting for Hitler, or something. And now we know more about what an absolute nightmare Brexit is, we should have a “vote of the people” to reverse it. Just look at all those Retweets and Likes: this law graduate warms the world with his insight and wisdom. It was politely pointed out to him that the Withdrawal Agreement isn’t the actual deal, which is still to be negotiated. So a second referendum now would indeed be “a vote in the dark”, for the Withdrawal Agreement merely sets out the path and parameters toward a deal, which remains a known unknown. 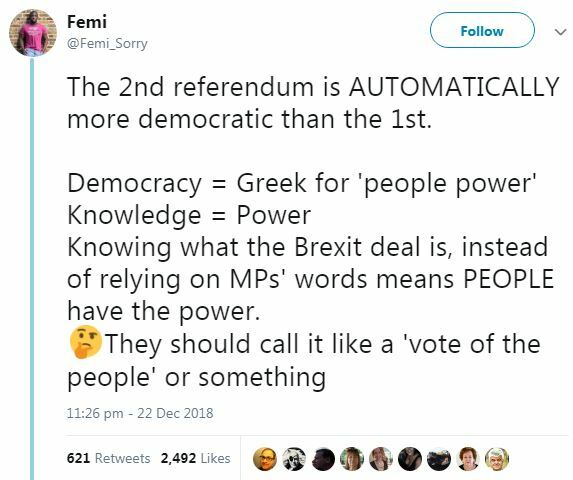 And it was also pointed out to him that a second referendum is not automatically more democratic if, for example, participation decreases or the franchise changes. He didn’t respond to either point. Perhaps he had a pile of ironing to do. Over the coming months you will hear more and more of Brexit zealots, Brextremists and Brexit Jihadists whose very existence is a threat to the Queen’s peace and imperils civilisation itself. You will be told of the bleakest impact analyses, intractable obstacles and impossible dilemmas. You will see reports of fear and hatred stoked by ignorant hooligans like Peter Bone. And through Twitter and Facebook bishops will nudge the faithful toward a ‘People’s Vote’, pointing their blessed fingers to the light of transcendental experience which will restore order and balance. And important newspapers like the Times will tell MPs they need to think again. And if they do not, the sun will be turned to darkness and the moon to blood. Just look at all those Retweets and Likes. But a remnant shall keep the faith and discern the signs of the times, for the time is at hand. 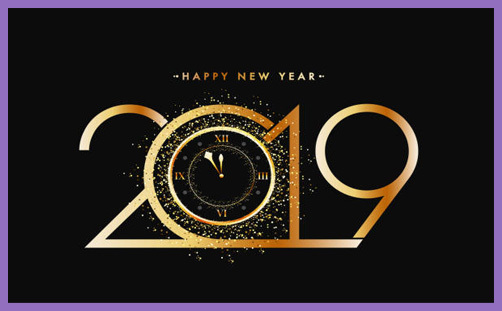 A Happy Brexit Year to all readers and communicants. Here’s to another year of contending for truth and kicking against the pricks.